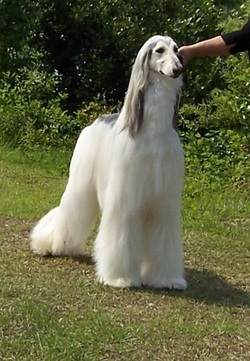 Jorogz' Adorah Snowtharra SC- "Snow"
.A beautiful Afghan Hound in body and soul, Snow was our dearly loved companion and had many admirers even though he never pursued a show title. He was not a lure coursing star either but was enthusiastic and determined when chasing the bunny. We will miss him terribly. Snow passed his sweet temperament on to his children. Am Ch Jorogz' Elsto Khariz-Za - "Diva"
Am Ch Snowdicken Sunshine KharizElsto JC - "Hansa"
Jorogz' Elsto Khariz-Ma - "Levi"
Elsto Khariz Dancin N The Dark SC - "Rave"
Norw Ch. Elsto Khariz Stella By Starlite - "Stella"